On February 19, 2019, my first monograph will be published. It’s called Emotions, protests, democracy: Collective Identities in Contemporary Spain, and you can find it here. This book is built on research completed over the past few years, and deals with the role of emotions in contemporary politics. With the rise of both populist parties and social movements in Europe, the role of emotions in politics has once again become key to political debates, and particularly in the Spanish case. Since 2011, the Spanish political landscape has been redrawn. What started as the Indignados movement has now transformed into the party Podemos, which claims to address important deficits in popular representation. By creating space for emotions, the movement and the party have made this a key feature of their political subjectivity. Emotions and affect, however, are often viewed as either purely instrumental to political goals or completely detached from ’real’ politics. This book argues that the hierarchy between the rational and the emotional works to sediment exclusionary practices in politics, deeming some forms of political expressions more worthy than others. Using radical theories of democracy, I construct an analytical framework based on concept of visceral ties, which sees emotions and affect as constitutive of any collective identity. 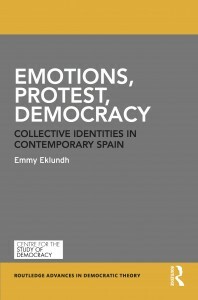 I later demonstrates empirically, using both ethnographic method and social media analysis, how the movement Indignados is different from the political party Podemos with regards to emotions and affect, but that both are suffering from a broader devaluation of emotional expressions in political life. I’m really excited to have this book meet the world!